A quarter sold at a weekend rare-coin auction for $1.5 million, the largest sum ever paid for a 25-cent piece, an auction house said Monday. 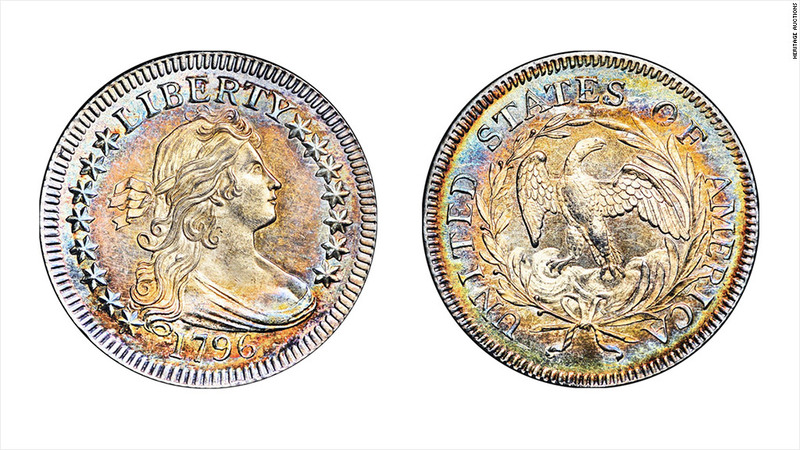 The 1796 B-2 Quarter Dollar was minted in Philadelphia in the first year the U.S. Mint produced a quarter, said Mark Borckardt of Heritage Auctions. It was one of about 6,000 minted that year and one of less than 500 that survive to this day, he said. "They have become extremely important and rare coins," Borckardt said. "The quality of this coin overall is just phenomenal. I have been involved in numismatics for 40 years ... and this is the finest one I have seen." The collector, 102-year-old Eric P. Newman of Missouri, purchased the coin for $100 in the 1930s, Heritage Auctions said. He spent about $7,500 building the collection of 1,800 coins. At auction, those coins went for more than $23 million. Among the other pieces in the auction were two 18th-century silver dollars that fetched a combined $1.7 million. Proceeds from the auction go to support a non-profit coin museum, the Eric P. Newman Numismatic Education Society.